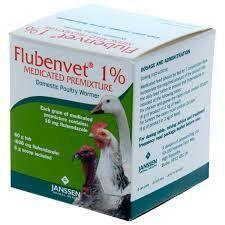 Domestic Poultry Wormer: Flubenvet Medicated Premixture is effective against gapeworm, large roundworm, caecal worm, hairworm, and gizzard worm in chickens, turkeys, and geese. Activity includes adult worms, larvae and eggs. Chicken and Geese 60 g of product (the whole tub) medicates 20 kg of feed. Turkeys 60 g of product (the whole tub) medicates 30 kg of feed. Medicated feed should be fed for 7 consecutive days. Incorporate the required amount of the product into the daily feed ration. The daily ration should be fed as a complete ration during the 7 days. Birds on the ground with known worm infestations are susceptible to re-infestation. In such cases, re-treatment with another 7-day course, after 3 weeks is recommended. Birds must not be slaughtered for human consumption during treatment. Treated birds may be slaughtered for human consumption only after 7 days from the last treatment; the meat withdrawal time is 7 days. Eggs - There is no withholding period for domestic poultry producing eggs for human consumption when the product is used at the recommended inclusion rate; the egg withdrawal time is zero days.